We have too much marketing content going live on daily basis. It seems every topic is covered to death by now. And how about all the outdated and simply wrong and dangerous advice we are being exposed to on a regular basis? How not to get lost or overwhelmed? This is what this lesson is about: How to manage your own marketing self-education. 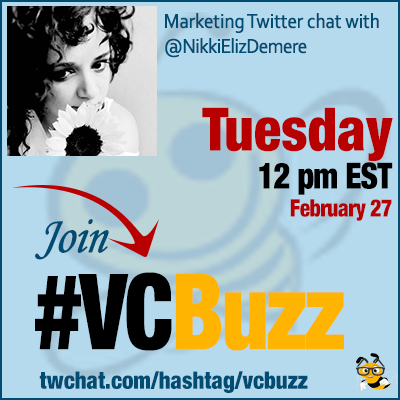 Nichole Elizabeth DeMeré @NikkiElizDemere is not new to #VCBuzz. we already had a pleasure of being taught by her back in 2015 when she gave us a great Twitter lesson on community management. These days, @NikkiElizDemere manages community growth at Zest.is and moderator at Product Hunt & Growth Hackers. Q1 How and why did you decide to join @ZestisApp team? In many ways @ZestisApp is a logical extension of what I do. I’ve always been an avid curator of art, music, and — if you ask my friends — people. And, I believe that creating a mutually beneficial community is vital for personal, professional, and artistic endeavors. The reason I joined @ZestisApp is that we align on four fundamental values: authenticity, helping marginalized voices to be heard, and giving back the power to the people (at least as far as it relates to how we, as professionals, consume content). For those of you who don’t know @ZestisApp (yet! ), it’s a Chrome new-tab extension built especially for marketers that shows custom-to-you content. That content is curated by Zest’s 15,000-and-counting weekly active members, rather than a handful of editors. There’s strict quality control in place by moderators (super-members) at @ZestisApp, but if an article provides significant added value and actionable takeaways, it doesn’t matter who wrote it — established influencer or up-and-coming thought leader. Q2 What problem is @ZestisApp solving and how? What’s your strategy of bringing its message across? Marketers also are responsible for creating those very same articles. Social Media filters, Google’s algorithms and machine learning are currently no match for people who have learned to game these systems and manipulate readers into clicking into useless articles. I wrote an in-depth article on exactly what we’re doing at @ZestisApp on @Canva if anyone wants to check it out 💛 We now have 15,000 members despite the title. Q3 What other ways are you using to always keep your marketing knowledge fresh? How do you monitor marketing trends and discover new innovative marketing tactics? In addition to @ZestisApp’s #community, I also participate in a lot of other communities, such as @GrowthHackers, @InboundOrg, @ProductHunt, Slack groups, and Facebook groups. I also read a lot of #newsletters 💌, such as those by @copyhackers, @getuplift_, @timherbig, @StefanW, @InVisionApp, @intercom, @hnshah, @Akita, @GrowthHackers, @sarahdoody, @ProductHunt. Q4 Speaking of trends, what are your favorite marketing trends that are just being born? I wouldn’t call this a trend (it’s here to stay) but I love the push that we’re seeing for authenticity from @ZestisApp, startups such as @Hotjar (they’re launching a new community called The Humans Strike Back), and individuals such as @WordWeaverFree and @randfish. Q5 What self-education tools are you using? How do you keep yourself motivated? How do you keep yourself organized, etc.? For self-education, I read a lot of #books. It’s amazing how reading a book can change your life. Right now I’m reading The Body is Not an Apology, Content Inc., and The Art of Community. I stay motivated from my desire to share with and help others. It fosters a kind of motivation I can’t even explain. For keeping organized, I use @passion_planner – there’s undated planners for anyone who is just getting started. I’ve also been told by @marijanakay that PowerSheets are super useful so I’m checking them out soon. If you want to learn more about #community, I just started a #newsletter called Sunday Brunch and I email exclusive content every Sunday about how to build, engage, and grow communities. You can subscribe on my site.